Coombe Villa is a stunning luxury stone cottage full of Cornish character, nestled in a tranquil waterside location on the beautiful River Fal on part of the famous Tregothnan Estate. Coombe Villa is dog friendly and located in an idyllic country village but is only just a few miles from the cathedral city of Truro. Imagine a stunning stone cottage full of Cornish character, nestled in a tranquil waterside location on the beautiful River Fal. Coombe Villa is the perfect location for your relaxing Cornish getaway, located in an idyllic country village but just a few miles from the cathedral city of Truro. Whether you see romantic walks in the countryside, gazing at wildlife, tracing historical steps, bicycle ride, or relaxation by the crackle of a wood burning stove, there is something for everyone with Coombe Villa as your base. First Floor: Kitchen with open plan dining / living room area. Small bedroom with shorter style children's bunk beds, TV and ensuite WC. 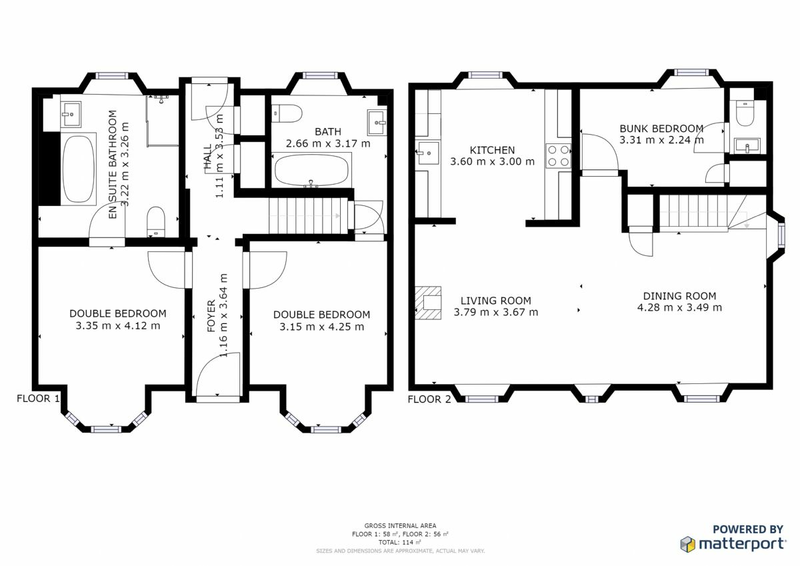 Ground Floor: 2 double bedrooms both with zip & link beds and with en suite bathrooms. One with a roll top bath with separate shower and the other with an over bath shower. Exterior: There is a patio with external furniture and BBQ. Heating is via electric central heating throughout and the cosy wood burning stove. The kitchen is newly fitted and has a range of modern equipment including an electric oven & hob, kettle, toaster, fridge and separate freezer, microwave, dishwasher, washing machine and espresso machine. The living room area has a flatscreen digital TV & DVD player, music system with CD, Radio and iPod docking station. There is WiFi available with superfast broadband & a telephone for local and incoming calls. There is a hairdryer, iron and ironing board available. Electricity, heating, a basket of logs for the log burner, bed linen & towels are all included, but you will need to provide your own beach towels. Parking facilities for your vehicles is available. Up to 2 dogs are allowed at an additional cost of £50 per dog / per week although please remember that you cannot leave dogs unattended in the cottage alone. A basket of logs is provided for the wood burner, thereafter available from the owner. Regrettably no smoking is allowed. There is a cot and high chair available. A welcome pack is provided in the cottage for your arrival, but also available as an extra (£30) is a very special wicker hamper containing Tregothnan produce including Kea plum jam, selection of teas and Housekeeper's biscuits. Also available is a stunning private tour of the Tregothnan Gardens (£70 per person). This tour is very special as the gardens are rarely open to the general public. The tour lasts around 2 hours and concludes with a Tregothnan cream tea. It is a very special treat! Kayak hire is provided for cottages in Coombe. You can pre-book your kayak (£162 per kayak per week, £65 per day for a 1 person kayak) at the same time as your booking. Exploring the River Fal by kayak is a simply magical experience whilst you are in Coombe. In addition, the Estate has a rowing boat available to hire (£186 per week, £65 per day, max 4 person) if you would prefer a slightly more sturdy vessel for your adventures! A mooring directly in front of the cottage is also available to hire (£25 per week) for boats up to 15ft. For larger boats up to 25ft, there are three floating moorings which can be hired on request and subject to availability. When taking to the water, guests are able to explore Coombe on the Cowlands Creek - a unique and special estuary off the River Fal. Discounts available for couples staying for 7 nights outside peak season, using one room only. The city of Truro is only about a 10 minute drive away and has a wide selection of good shopping including a Tescos, Sainsburys, Marks & Spencer and many other high street outlets. There is also a cinema and a great selection of restaurants, pubs & cafes. The resort of Newquay is about 16 miles to the north with its spectacular surf beaches at Fistral & Watergate Bay. Jamie Oliver's "Fifteen" restaurant is located here. Padstow, with its fine selection of restaurants influenced by Rick Stein is just over 20 miles. The yachting centres of Mylor, Falmouth & St Mawes are all within easy reach of the cottage. There is a watersports centre at nearby Loe Beach where you can learn to sail or windsurf. The nearby Roseland Area of Outstanding Beauty with its superb coastal walks is also a short drive away via the King Harry Ferry. The Cathedral City of Truro is in the heart of Cornwall and offers a wealth of facilities for the visitor. Dominated by the stunning cathedral, it is one of the south west's most attractive cities. Lemon Quay plays host to many events throughout the year including the Cornwall Food & Drink Festival in the Autumn and the famous Truro Fatstock Show just before Christmas. Regular farmers markets occur every Wednesdays & Saturday and there are also arts & craft markets on Saturdays. There is a wonderful range of shopping for the visitor including all the regular high street stores including Marks & Spencer, Tescos & Sainsburys, but also a wide range of more specialist stores. It really is worth a wander through the back streets and alleys to find some fabulous little boutiques. Truro has a superb range of restaurants from Bustopher Jones & Mannings on Lemon Street to the always popular Pizza Express. There are lively bars, pubs & nightclubs including the superb Old Ale House, a busy Wetherspoons and the infamous L2 if you are so inclined! The Hall for Cornwall hosts everything from Shakespeare to rock concerts and the cinema on Lemon Street has all the latest releases. A truly beautiful, peaceful and magical retreat. The villa is very comfortable and done to an extremely high standard. The location for riverside and woodland walks is perfect. The swans paid us a visit every morning and evening, and our hosts were kind enough to leave us some bird food for them, along with fresh flowers and a delicious array of tempting biscuits and teas. An ideal family retreat from the madness of modern life, i couldn't recommend it more highly - thank you Coombe Villa! Guest from Jersey stayed for 4 nights. This house is in the most beautiful location so make sure you leave time to to enjoy and explore it. We have a very lively toddler and she loved watching the birds from the lounge window. The house is lovely inside and out. The kitchen has everything you need, the bathrooms are a treat and the beds are comfy. Our only regret is that we didn't stay for longer. Stayed in a 3 bed cottage in Coombe in August. Lovely well maintained and very well equipped cottage in a stunning location. It was expensive for a weeks self catering but it was high season and on balance was worth it. Very good service from the local agent who responded promptly to a couple of requests and obviously takes great pride in providing a high standard of accommodation. Only niggle was we'd hired a couple of Kayaks for the week as part of the holiday but the location and tides meant they didn't get used much at all so was a bit of a waste of money. Should have researched this a bit more. Overall a great holiday in a convenient and stunning location and we'd happily return. Guest from Bridgend stayed for 7 nights. A real home from home. This cottage is so well equipped they have thought of everything you would need for a comfortable and relaxing stay. Excellent standard throughout. Fantastic views from the cottage of the ever changing scenery. Lovely walks from the door without having to use the car if you don't want to. Only a short drive to Truro and the main routes. We didn't get around to hiring a boat but will definitely do that on another occasion. This was our 3rd visit and will definitely return. If you like peace and tranquillity and the comforts of home then Coombe Villa is the one for you. Guest from North Berwick stayed for 7 nights. Coombe villa is literally the best equipped and furnished holiday house I have ever stayed in, no attention to detail has been forgotten. Very comfortable and cosy. The owners can arrange for tasty meals to be delivered too. Set in an idyllic location at the creek head it is fascinating watching the tide of the Fal River ebb and flow from the cottage windows or front garden. Lovely walks nearby and local neighbours are friendly and helpful. Our dog began to think she owned the village, so I think she was happy too! We loved it. Guest from Southam stayed for 7 nights. Having stayed before we noticed various things now need attention. Paint wants touching up in a lot of places. Chair and settee in lounge were worn and now uncomfortable. Sash Windows need attention. This is the most expensive cottage we have ever stayed in so you expect near perfection. Thank you for your review - it was a pleasure welcoming you back and assisting your family during your stay. We truly value the opinions of our guests and we apologize that we did not meet your expectations this visit. We carry out regular maintenance throughout the year which is also reliant on the weather and we apologise that these decorative works had not been carried out prior to this stay. Works are updated and we hope to welcome you back in the future to continue to enjoy our special area of Cornwall here in Coombe. Guest from Nuneaton stayed for 7 nights. Great location. Great property. Very peaceful location for relaxing. Lots to do from your doorstep and many activities a short drive away. Guest from Badminton stayed for 4 nights. Guest from Bideford stayed for 7 nights. Our week at Coombe villa was perfect. Everything you could possibly need was provided and the cottage sits beautifully in its setting. Highly recommend this lovely cottage, and the company that markets it has been professional and helpful. Many thanks. Do I regret staying here? Absolutely not. An excellent property in a lovely position, having two, apparently non conflicting, characteristics of being handy for shops (Truro nearby) whilst in a completely rural setting. Very well equipped. Beds comfortable albeit with an overly large duvet (in at least one bedroom!) Absolutely no regrets. Guest from Chichester stayed for 7 nights. A comfortable, superbly-furnished holiday retreat in an idyllic location; it exceeded all our expectations, providing everything we could have wished for and more. The creek is a secluded gem, and we enjoyed the many local walks, the diverse bird life, and just watching the tidal movement of the water. The location is perfect for accessing other attractions, but we found it difficult to drag ourselves away from the serenity there. Guest from Shrawley stayed for 7 nights. Overall a lovely stay in a beautiful place. Well fitted rooms and good decor, however we would have a few thoughts to share with you: The central heating seemed to be on during the day and off in the evening so we had to have the log burner on. A bag of logs for £5 hardly did a night and we had been used to staying in cottages where the logs were all included. Also we were only provided with one left hand glove for the log burner which was not the best for 3 right handed people, a pair would have been the best. The bathrooms were only heated by a towel rail and had stone floors so extremely chilly! We were provided with loo rolls, washing up liquid, salt and pepper, 2 black bin bags to last a few days- luckily Lucy brought us more loo rolls and washing up liquid. We would find it useful to be told beforehand what is provided so we can bring it with us, or to have a basic stock to last the stay. Guest from Sidmouth stayed for 4 nights. As a family of 5 with dog we had a really lovely time at Coombe Villa, out in the rain in the days, games in front of the fire in the evening. Very clean and well presented accommodation, we would happily return. Guest from Telford stayed for 7 nights. Perfect, well equipped,accommodation for two couples in a fabulous location. We thoroughly enjoyed our stay and especially enjoyed the view overlooking creek. Lovely house in amazing location. Layout is inverted (main bedrooms downstairs) to get the best out of the stunning view over Coombe creek. Downstairs bedrooms have the biggest en suites I have ever seen. Lot's of great walking nearby and opportunities for messing about in boats. The drawback of the amazing location is that there is some driving down narrow roads to get there, but its only 10 minutes from Truro so not too bad. One of the things that attracted us to this house (apart from the riverside location) was the look and feel of the decor which is cleaner and more modern than the slightly chintzy look you get in most holiday homes. This is a professionally managed holiday home and you can really see the difference. We will be returning! Guest from Oban stayed for 7 nights. Fabulous house is beautiful location! We LOVED our holiday at Coobe Villa and can highly recommend this wonderful house. It is really well laid out and very homely. Beautiful bedrooms with lovely ensuites - the bathtub in our ensuite was heavenly! The kitchen is well equipped and everything was immaculate! There is lots of attention to detail in the presentation and information available. Our 1 year old loved it, as he had lots of space to play and adored watching the boats out of the window. Coombe itself is stunning and we enjoyed lots of local walks with our dog Toby. It is in a great location for exploring Cornwall, only 10 minutes drive from Truro. We would recommend visiting the Eden Project and also we had a super meal at The St. Mawes Hotel. Can't wait to go back. Thank you Cornwalls Cottages for finding us our perfect holiday! Magical location, lovely well equipped accommodation. Only niggles were 4pm entry to cottage and steep price to view gardens. No garden is worth £70 for a two hour tour! Guest from St.albans stayed for 7 nights. We all thoroughly enjoyed our stay at Coombe Villa in a stunning part of Cornwall. The cottage contained everything we needed, it was beautifully presented and the decor exceptional. Guest from Smallfield stayed for 7 nights. Guest from Sandbach stayed for 7 nights. Coombe Villa is a nice quiet and relaxing place which is extremely handy being only 10 minutes from Truro so you can be on the fast Cornish roads quickly to go places. Tranquil with nice walks and a lovely view of the creek. This was our 3rd time of visiting! So must be doing something right! It is comfy, charming and a solid cottage. Very relaxing and lovely to return too after a hard days garden wandering. Below is a list of very very small issues which just for feedback I list. None of them by any means detract from a nice time in the cottage. The bathrooms are large and have nice powerful showers. The alarm clocks are the old tick ones with bell at the top which are annoying though, so we just moved them to other rooms. Changing these for digital silent ones would be better. The only small gripe we had which is not the renters/owners fault is we had to wash every piece of crockery and cutlery we wanted to use as they were still dirty from previous tenants with food stuck on them still (Urr!). So either they were rubbish at washing up or the dishwasher did not work very well, or they did not know how to use one. We just used the sink and washed by hand so everything was clean and non dishwasher "squeaky". The cottage itself has everything you'd need. One omission though was that two shelves in the oven would have been better than just one, as if you want to put more than one thing in at the same time it was an issue. Also FYI, the battery in the weighing scales has gone, (CR3032) which needs replacing with another. If it had needed a AA or AAA I'd have done it myself. The bathroom off the right hand bedroom as you enter the cottage has a problem with the extractor fan not opening right when you turn it on. You have to manually open it, never opens at all, even after 20 minutes. This was the same last year, but we coped so maybe you did not know about it so just letting you know. Overall the cottage is great and we would definitely recommend to anyone. Intend to return! Guest from St Mary's stayed for 7 nights. I spotted Coombe from the air a few years back and made a note of it as it looked like a very special location. It was every bit as good as anticipated, idyllic, uncrowded, unspoiled and with friendly natives! We had the bonus of being there at the hight of the primrose season - carpets of them. Guest from Cardigan stayed for 7 nights. This a lovely cottage which is beautifully presented, in a lovely peaceful situation. There were walks from your door and it is a great place to enjoy the countryside and the variety of birds in the estuary, including listening to the owls at dusk. The cottage is so convenient for visiting Truro and many other beautiful coastal places. We were very impressed with the effort and attention to detail that had gone into making sure that guests enjoyed their stay, which was apparent from all the little touches that were in place in the cottage and all the detailed information put together in the visitors book. The fire was even laid ready for us to light in the wood-burning stove upon arrival. After being out all day walking, it was lovely to come back to enjoy this cottage with it's fabulous views of the creek, to sit in front the log burner and enjoy some Tregothnan tea and shortbread. We shall definitely be returning. Thank you so much for everything. Not really suitable for a winter let, downstairs very cold and damp. House has economy 7 heating and was therefore never warm. Lack of hot water was a huge issue. It was lovely to welcome you back to Coombe Villa however, we were surprised at this feedback after your 5/5 positive report after your first stay with us. We would like to confirm that the heating throughout is NOT Economy 7 but Farho electric radiators. The system can be fully controlled and temperatures can be adjusted by our guests at any time during their stay to suit their own comfort. The control panel is conveniently located in the hallway entrance and we are also just a phone call away if you need any assistance 24hrs a day. Our hot water is heated overnight and the Mira Sport Electric shower provides hot showers 24 hours. In our welcome letter and telephone call to the cottage, we do ask f you have any concerns about anything during your holiday, please raise it with us during your stay. This way we are aware and able to rectify as soon as possible. Had we known of your concerns about the heating during your stay, we could have looked into the situation for you and if needed even offered extra heating including electric blankets. We do hope you will return to Tregothnan Wild Escapes in Coombe. Guest from Buckfastleigh stayed for 4 nights. A beautiful location, fantastic accommodation and well equipped to provide as perfect base for either local walks or further exploration of Cornwall. We will definitely be returning. Guest from Woking stayed for 7 nights. Coombe Villa was much more than a country cottage. It was a substantial house with excellent facilities and the most superb location. It was such a delight to wake up to that view every morning and there were so many beautiful walks that you can do straight from the front door. The accommodation was excellent and we were very comfortable. Only a couple of things to mention: 1) The garden is not enclosed - not good for our adventurous dog! 2) The stairs are fairly steep so would not, in my opinion, be suitable for all. An extreemly well equipped cottage in a beautiful setting, Tregothnan have catered for every need. Would definately consider another cottage on the estate. Guest from Bridgwater stayed for 7 nights. We have been coming to Cornwall for many years and have stayed in many properties offered by different agents and owners. with this agent and with the property we were very impressed with all standards of information and the property its self. We had no trouble with either booking everything was sorted at first contact. It was a perfect stress free holiday in a perfect place. Guest from Gt Yarmouth stayed for 7 nights. A beautiful house in an amazing location. Fantastic views of the creek from the house with lots of walks in the area. House thoughtfully equipped with everything you need including wellingtons and a basket for foraging in the countryside. Wonderful! Excelent location with stunning views. Very well equipped and comfortable property. Thouroughly enjoyable break. Easy access (with car) to all attractions. Guest from Bradfield stayed for 7 nights. It is always tricky to find a holiday/house/location to suit everyone when you are trying to accommodate teenagers through to grandparents & of course, a dog...but this year we did it! Coombe Villa was gorgeous! The setting was idyllic...views over the river which was literally outside the front door. The house itself was immaculate and finished to a wonderful standard (we always look to find something better than we have at home). There were amazing walks so that covered the dogs and grandfathers requirements! There was even a pretty tea shop (with amazing views) nearby and which served wonderful Cornish cream teas. The location itself meant that we could travel to lots of Cornwall within half an hour so surfing and skateparks were doable (again Grandfather sorted!...okay, I mean teenagers!). In fact we didn't want to come home and looking to book next year. Guest from Epwell, Banbury stayed for 7 nights. Our second time staying at Coombe didn't disappoint - Coombe villa is well appointed and comfortable, with the first floor lounge making the most of the amazing views. Having stayed in a lot of holiday cottages, I firmly believe that you get what you pay for, and so consider Coombe Villa to be good value - especially if 6 of you are staying there, although it really only sleeps 4 adults & 2 children due to the bunk beds.... My only slight criticism, therefore, would be the water pressure of the shower - I would expect a true "rain shower" experience for this level of property. Having said that, it certainly didn't ruin our stay & we will be back for sure. Guest from Sutton Coldfield stayed for 7 nights. The purpose of this holiday was to relax. The location of Coombe Villa is great, remarkably peaceful and the accommodation is of a very high standard. It was billed as dog friendly and it did not disappoint. Lovely touch having a bowl of water for the dog at the front door upon arrival. It would be hard to find fault. If I have one minor criticism it would be that it may be a little too remote as there isn't a public house within walking distance. It would have been nice to walk to a pub in the evenings for food. Having said that, the peaceful quiet is extraordinary. Being from a city we get so used to the constant background hum of traffic. Here there is birdsong and the sound of the water lapping against the boats. You can sit on the terrace and hear locals having a chat on the other side of the inlet. Idyllic spot, quiet, secluded, yet only a short drive from Truro (catch the farmers market on Saturday while waiting for the 4.00 arrival time) Interesting walks, loads of birdlife, including a jackdaw who somehow managed to get itself into the log burner one morning (great way to wake up), rabbits, rabbits, and more rabbits. Property has been very well modernised with living and dining on the first floor to better take advantage of the views; big well equipped bathrooms, and attention to detail on little touches like walking sticks and wellies (and, intriguingly a very large axe), individual teapots for up to six people, espresso machine, meant that little things like the poor fitting of kitchen units and cheap kitchen knives and pots and pans really stood out and 'grated'! Tregothnan staff really attentive and helpful. Be aware that boat/kayak hire is limited to the creek, you cannot explore the Fal as the website suggested when I booked, and access is limited to an hour or two either side of high tide. Thank you for your review and it was a pleasure meeting you both. The Fal River which starts at the mouth of Coombe Creek is very busy, especially in the Summer months. Wild Escapes on the Water are licenced by the Truro Harbourmaster for the boats/kayaks to be in the parameters of Cowlands Creek - this itself is a large area to cover whilst rowing, with lots of unique areas to discover. As per our guest guidelines we do this for your safety however, if you wish to go further afield, it is only a phone call away to me or Roseland Paddle & Sail. We can then make special arrangements for you from their nearby location at Loe Beach in Feock where they are licenced for further onto the Fal River. Our kitchen appliances are chosen for their durability and longevity; Dualit kettle, toaster, espresso machine  we also do our utmost to ensure our kitchen equipment meets the same spec and are checked on the weekly changeovers by your housekeeper. We thank you for your feedback and will look into the knives, pots and pans, We hope to welcome you back very soon to continue to enjoy our special area of Coombe. Stunning house in a stunning location. Quiet and peaceful but with Truro, country walks and beaches on your doorstep. The property is well equipped, beautifully decorated and seriously makes the perfect holiday escape. Could not ask or want for a better holiday house and location. Guest from Sandbach stayed for 14 nights. Fantastic! Perfect place to stay. Really quiet and peaceful. Well equipped cottage, large bathrooms. Fantastic views and walks around the area. Parking for 2 large cars. Very central being just 10minutes from Truro and the road links around Cornwall. Great place to relax and unwind. Really friendly helpful staff. Only very small criticism note to help improve even more:- Zip/Link Beds could be better/more comfortable if they were proper king size beds. Sofa a little soft now, for our taste, but perfectly functional. Overall a great place to stay! Guest from Guestling stayed for 7 nights. Ever thought the world was moving too fast? Ever wanted to slow down in some tranquil place where you could kick back and relax in peace and quiet? If your answer is yes to both of these questions then Coombe Villa could well be the place for you. To sit by the window in the upstairs lounge and watch as the day slowly changes with the ebb and flow of the tidal creek will take you to another, slower, world. Well appointed, close to the waters edge, thoughtfully decorated, warm and comfortable, it had everything we needed for an idyllic week away from home. The walks around the cottage are varied and beautiful, and if you need more, you are never far from somewhere to go or something to do. Although it feels like you could be in a small sleepy hamlet in the middle of nowhere the truth is that you are only ten minutes drive from Truro, and most of southern Cornwall is within easy reach. We loved it and didn't want to leave. Fabulous location. Had a fantastic week in a stunning cottage. Local staff all very helpful. Will definitely be visiting again in the near future. Thank you for a wonderful break. Guest from Bridgend, stayed for 7 nights. loved the isolation and quietness, wonderful place to relax plenty of walking areas, once you have ..arrived no need to use the car. will book this cottage again. Guest from Bridgend stayed for 8 nights. Whilst Coombe Villa proved an exceptional holiday cottage, it's greatest feature is it's setting in the delightful creek side hamlet of Coombe. It is an extraordinarily peaceful and unspoilt place where the ebb and flow of the tide and the call of wading birds forms the perfect backdrop to a relaxing holiday. Use of the wood burner gave an extra cosy feel to the evenings but our only suggestion is for a slightly more generous log allowance at this time of year. The cost of a few more logs would be offset by reduced electricity costs for the radiant heaters. Having to buy extra logs was something of a chore. A wonderful week and we will return! Guest from Lincoln stayed for 8 nights. The house and its location are just as beautiful as they appear in the brochure. The log burner adds to the cosiness of this amazing house where we stayed in December 2013. The information pack could not have been more informative. Things I felt not so good are that the bedroom and bathroom floors are cold, although slippers are provided! Washable mats in bathrooms may help at least to make it appear warmer and more inviting. The settee, although fine for shorter periods, would benefit from new fillers in seat cushions. We took dog towels but perhaps these could also be provided. Apart from those points, the house is equipped to a high standard with everything you could need. It is a fantastic base for exploring the area and so nice to return to. Admin and welcome were faultless. If this is the Cornwall Cottages standard, I shall be looking at their properties for future holidays. This was our second visit to coombe villa. We love the location and the comfort of this cosy retreat. The log burner is a real plus point on chilly evenings. Guest from Whepstead stayed for 7 nights. We had such a wonderful week the house was beautiful with outstanding views. Our children loved the riverbank and want to put their wellies on at every opportunity to explore. The location is very central for days out and plenty of Restuarants in Truro for the evening. Just one very small complaint, the mattresses were so soft and squishy. I didn't want to go home but I couldn't wait to get back to my own bed. Guest from Twickenham stayed for 7 nights. What a find! This cottage was the best holiday let I've ever stayed in. The best equiped, most comfortable, superbly scenic location, reasonable price. Guest from Tewkesbury stayed for 7 nights. Guest from Brierleyhill stayed for 7 nights. We couldnt have have imagined coombe villa to be in such a beautiful setting,so peaceful and picturesk.A fantastic cottage with every thing you needed catered for making a fantastic holiday. Guest from Theux stayed for 7 nights. Beautiful house situated in a wonderful and extremely quiet place. Also great to stay with kids. If you like nature and peace, that's the place to stay. We will return for sure. At Holly Cottage escape the mayhem of everyday life to indulge in casual luxury and serene estuary views. Holly Cottage has been newly renovated and is nestled in an idyllic riverside village on the historic Tregothnan Estate, but is just a few miles from the cathedral city of Truro. One of our many dog friendly cottages. This idyllic stone cottage lying right beside the creek in the beautiful hamlet of Coombe is a serene place to visit. It is a superbly refurbished traditional luxury cottage providing a totally relaxing escape yet in a wonderfully central location only a few miles from the Cathedral city of Truro. You can wander the footpaths along the river through the unique Kea plum orchards or relax in the cosy living room around the warming wood burning stove. Dog friendly. Escape the mayhem of everyday life to indulge in casual luxury and serene estuary views. A perfect location for your relaxing Cornish getaway. Penjerrick is nestled in an idyllic country hamlet on the shores of the River Fal but just a few miles from the cathedral city of Truro. Ruan Dinas is the perfect location to escape the mayhem of everyday life and indulge in casual luxury and serene estuary views. There is the added bonus of a drying mooring, which you can book at no extra cost, and a slipway at Roundwood Quay 10m from the garden where you can launch your boat. There are few better spots to have a fantastic family holiday or romantic getaway. Low occupancy discounts based on a couple using one bedroom. One of the Tregothnan Estate's Wild Escapes, Bethel Cottage is one of those cottages you just dream about. In a beautiful creekside setting, surrounded by rolling countryside, this cottage has been recently refurbished to provide the perfect peaceful retreat for those looking for a complete escape. Watch the wildlife on the incoming tide from your bedroom window, wander along the creekside path through unique plum orchards or in the winter relax beside the cosy woodburning stoves. The quintessential escape is only 10 minutes' drive from Truro with its superb shops & restaurants. One of our many luxury dog friendly holiday homes. Nestled amongst the beautiful Kea plum orchards unique to this unspoiled part of Cornwall lies Turn a Penny; a magical bolt hole where you can indulge in casual luxury and serene water views. You are just a few steps from the beautiful tidal creek at Coombe. Pencreek is one of Cornwall's really magical creekside (riverside) cottages. Nestled amongst the beautiful Kea plum orchards of the Tregothnan Estate in this unspoilt part of Cornwall, this romantic cottage offers a luxurious wild escape with serene water views. The quintessential escape, yet only 10 minutes drive from Truro with its superb shops & restaurants. One of our luxury, dog friendly holiday cottages in Cornwall. Heron's Catch has undergone a complete renovation and is a fabulous reverse level property with great views from the open plan living area across the tidal reaches of the Truro river. To the rear is a steep terraced garden with a large decked area at the top with magnificent views of the creek - not to be missed! The Studio is a stunning little bolt hole with majestic views south down the Carrick Roads towards Mylor, St Mawes and the Roseland. It is a bright little cottage with a cosy wood burner for the winter and a south facing sun deck for the summer. Here you can revel in the breathtaking views and privacy while only a stone's throw from the beach. Restormel is a 2 storey, well presented property with glorious views over the tidal creek at Penpol, just 10 minutes from Truro. There is a lovely roof terrace where you can enjoy the views and the property also benefits from a creekside garden with added tidal pontoon, out haul and mooring if you are bringing your own boat.